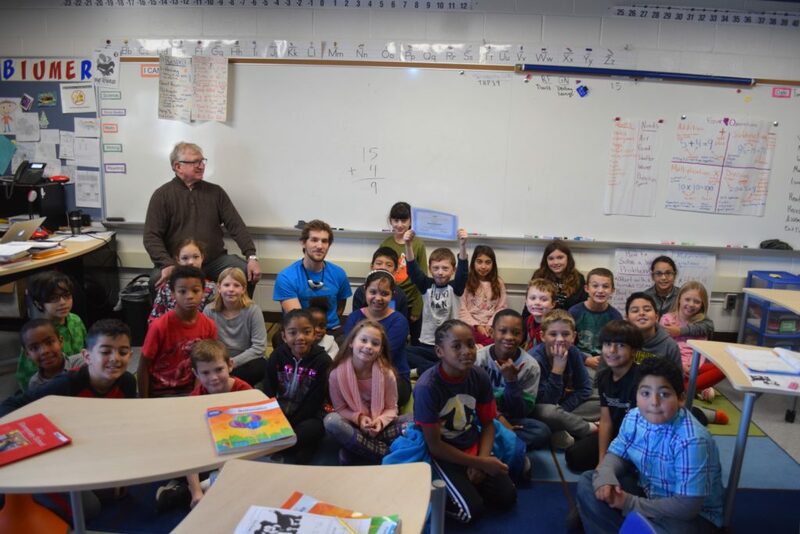 Literacy efforts at elementary schools across the Ann Arbor Public Schools received a boost this month when seven projects received grants from the Karen Thomas Memorial Fund. Former Board of Education Trustee Andy Thomas surprised teachers at six schools with the grants from the fund created ten-years-ago to honor his late wife. Thomas says this was the most challenging year to select which grants to fund, since a record number of 23 applications were submitted, requesting a total of $60,000. Thomas looked for the projects that would most directly impact students facing the biggest struggles with reading. “Every single one of them was really high quality, there wasn’t a clunker in the bunch, they were all great requests,” Thomas says. David Blumer from Allen Elementary received a grant to update the school’s book room. Wonder Barton from Bryant Elementary received a grant for a reading beyond the classroom program. Karen Gerhart from Lawton Elementary received a grant for an Inspiring Readers! program. Amy Rodriguez from Logan Elementary received a grant to update the school’s library to reflect a diverse cultures and interests. Vanessa Sanmiguel from Mitchell Elementary received a grant for a literacy book giveaway project and the Latinos Con Libros (Latinos with Books) program. Sharyl Burau, Rachel Taylor, and Jane Taylor from Thurston Elementary received a grant for the 300 books before kindergarten/Thurston Families Read program. Thomas says he created the fund to honor his wife who was an avid reader. Karen Thomas came to Ann Arbor to study journalism at the University of Michigan and achieved her dream of writing for national publications. Thomas felt promoting this passion in reading in the Ann Arbor Public Schools was a good way to remember her. “I wanted to create a tribute to her and I couldn’t think of any better way of doing that than by supporting literacy projects throughout the district,” Thomas says. The Karen Thomas Fund doesn’t have a marketing budget so all funds raised go towards reading grants in AAPS elementary schools. Thomas says this is a great use of the funds, but means the fund relies on word of mouth to raise additional dollars. Donations to the Karen Thomas Memorial Fund can be made through the Ann Arbor Area Community Foundation.